What is the recommendation for FJ batteries these days? I replaced mine with a sears diehard gold, regular version. So far, so good for over a year. The diehard AGM, sometimes has problems in cold weather, where it has to be warmed up, before it will start the vehicle. Turning the lights on for a couple of minutes, warms it up. I just bought an Odyssey 34R-PC1500T. about $230 and 4wheel parts had it in stock. Thanks Eric, Found one only $2 cheaper on the web so you got a deal. Likely my path. Any thoughts on Optima Yellow Tops? Are they still crappy? Interstate makes a AGM battery with 4 year free replacement like the old diehards. Google search interstate MT-7 agm. Mrs. Jimbolio said she'd go for it if I could send her a link. So I went for it. Thanks for the recommendations everyone. She even got a 3% Ebate back on it! Thank you for shopping at www.4WD.com. Please save this email for your records. Should you have any questions please email custserv @ 4wd.com. 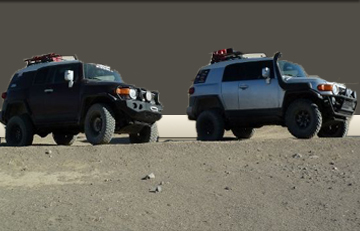 This vehicle has been modified to enhance off-road performance and has unique handling characteristics. 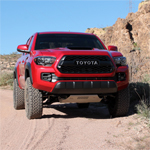 Because of the higher center of gravity and/or larger tires and wheels, this vehicle may have a higher risk of rollover, and handles and reacts differently than your stock vehicle, both on and off road. Extreme care should be taken to prevent vehicle rollover or loss of control which can result in serious injury or death. Avoid sudden sharp turns or abrupt maneuvers. Slow down. Be sure to get comfortable with your newly modified vehicle. Finally, be sure that you and your passengers use their seatbelts at all times – seatbelts save lives! It is the customer’s sole responsibility to have all nuts and bolts re-checked for tightness and proper fitment within 10 days after delivery, and then every 3,000 miles thereafter. Please return your vehicle to any 4Wheel Drive Hardware location so this can be done for you free of charge. This is critical for your safety and the safety of the people around you. Failure to do so can result in product malfunction which, in turn, can lead to serious injury or death. Also, wheel alignment and steering, suspension and driveline systems should be inspected by a qualified mechanic at least every 3,000 miles to ensure the safety of your vehicle. That's the exact model battery I went with from them after a weeks worth of research. I heard a "rumor" they used to be partnered with diehard and then split. I had Pepboys run the specs on it with their diagnostics and the battery came back around 1200 cca's! That's around 400 more cca's than stated. I also read a write up on similar stats for that battery. I almost went with the Northstar brand AGM which seemed from my reading very good as well. But 4wheel parts seemed a more well known company to me. I thought if something happened it might be easier in the future for me to return it to them. The only thing I pondered on was after purchase I ran the battery manufacture date and it was manufactured approximately 9 months before I purchased it. I read that could be a bad thing. Of course I may have read too much after a week of searching. It's already being shipped. I'll be back on the road in No time. But this one goes to 11! I did buy a cheap wet deep cycle from Batteries plus for my 2nd battery as a stop gap measure. It was $117 I believe for a type 31. It's doing such a good job running my xmas lights, ham radio and refrigerator I will probably keep it until it dies. Dang, I was late to this thread. Looks like it was already handled, but I'll go ahead and throw out my recommendation: rectangular and full of angry pixies. I went with the same about a month ago. Best battery I have ever owned. Curious as to why you didn't go with the larger group 31 battery?